Today’s massive lockup expiration has hung like a black cloud over Facebook. But there’s no more specific moments investors can point to and say “I’m not buying until after that,” and finally Facebook may start trading on its merit. The 773 million shares unchained today may continue filtering into the market, but its 8.62 percent boost shows this may have been the day Facebook bulls were waiting for. November 14th – And now, many bullish potential investors I spoke to said they wouldn’t sell until after today’s mammoth 773 million share expiration subsided. These factors have suppressed Facebook’s share price and warded off investors. In the meantime, though, Facebook has actually answered several of the big questions about mobile and plotted a path to greater monetization. As I wrote, Q3 was about laying the groundwork for the next phase of its business model. 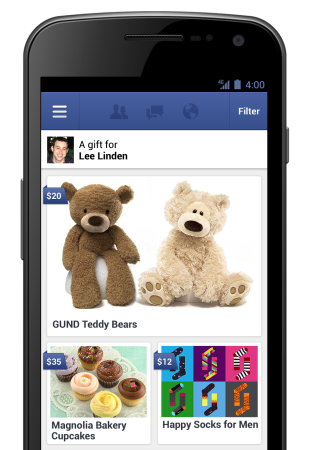 Facebook entered e-commerce with the debut of Gifts. It officially launched its developer-focused mobile app install ads, taking a crack at the huge paid discovery market. Very positive results from Facebook Exchange showed it could soak up retargeted ad budgets previously devoted to Google. It revved up its new search ads program with Sponsored Results in the search typeahead. And perhaps most promisingly, Facebook launched its mobile ad network. This lets it monetize its vast silo of user data off-site so it doesn’t have to show more ads and degrade the experience on its own properties. All of these have the potential to make Facebook money on mobile in ways that simply weren’t on the table before the IPO. And many investors were weary to bet on them as they emerged with large lockup expirations on the horizon that could erase their progress. Now there’s just two small expirations left, for 155.9 million shares of employees on December 14th, and 47.3 million shares belonging to Russian investors Mail.ru and DST on May 18th, 2013. Combined, those equal less than a third of how many shares became available today. Then in September 2013, Zuck’s one-year promise not to sell will have ended, but there’s no sign he’d want to sell too much, especially knowing how that could be perceived. Now is the time for Facebook to start trumpeting any positive results from its new revenue streams. If studies show Facebook Exchange can compete with Google, that Gifts is significantly boosting average revenue per user for those with access, or that developers are lining up to buy app install ads, Facebook should highlight them. Similarly, it might be time to announce a more open expansion of the mobile or web ad network, or introduce Sponsored Results ads into its App Center search. There are definitely more questions and stumbling blocks ahead. Facebook has to make sure users aren’t getting bitter about the big increase in mobile ads they’re seeing. It needs to remain vigilant to avoid privacy catastrophes. Plus all of its revenue channels need to keep accelerating, and there are plenty of reasons they could top out and limit Facebook’s earning potential. Surely there will be pops and drops as new products launch, but veterans leave, as startups get acquired and competitors emerge. Plus Facebook may have urged employees not to dump all shares today, and the effect could trickle out over the coming weeks. If the stock price keeps inching upward, though, it could aid Facebook in combatting another long-term problem: talent attraction and retention. There’s no massive upside like when it was still small and private. To stave off disruption, Facebook needs to be where brilliant people want to work. More green signs next to the share price could convince top talent that Facebook is going to win, change the way we communicate for years to come, and is the place they can have the most impact. The bulls may finally be free.